Sandy believes that solid fundamentals lead to confidence in ability. 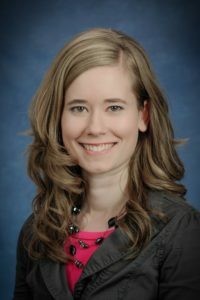 She likes to use well-researched and proven teaching techniques to bring out the best in students. Listening, singing and thinking are the priorities of every lesson. Getting to know her students and the music that motivates and moves them on an emotional level is the rewarding process that has kept her teaching in the Sussex area for over 20 years. A variety of music study opportunities abound in her studio: Group and private lessons, annual recitals, master classes with state university instructors, accompanying other students, adjudicated events and basic digital piano/electronic keyboard operation. She offers a free meet and greet time to all her students prior to starting lessons. Sandy studied voice, piano, and piano pedagogy at UW-Waukesha and Alverno College as an adult and continued private piano lessons with Don Stimpert of Waukesha. She is also certified to teach nationally-known MusikGarten programs. Sandy regularly updates and improves her skills through attending annual workshops and seminars – the studio wall is full of certificates of completion. Currently, she is studying classical voice with our instructor, Darralyn Scott. List of Piano Methods Used: Alfred Premier Piano Method, All Alfred Piano Courses, Faber’s Piano Adventures, Bastien Piano Method, Hal Leonard Piano Student Library’s Piano Method, The Music Tree, Piano Discoveries by Lorenz Publishing, Glover Piano Method (Piano All The Way), John Thompson’s Piano Method, John Schaum’s Piano Method, Leila Fletcher’s Piano Method, Hal Leonard Adult Piano Method, Piano Adventures Adult Piano Method, Keyboard Encounters Adult Group Method, Musical Moments Adult Group Method, Way Cool Keyboarding for Kids and Teens. As a certified Musikgarten instructor, Robin believes in the benefits of early interaction with music for the young child. In this program, parent and child enjoy singing songs and movement together while building important music foundations. Classes for infants through early elementary age are offered. Darralyn brings a deep understanding of the vocal mechanism to her lessons with those who want to learn beautiful vocal production. Each individual student’s needs are important to her and she offers her keen, intelligent listening abilities to whatever type of singing her students want to pursue. Intonation and good musicianship are woven into every lesson with an artistic yet enjoyable approach. Her students sing all styles from classical to pop music and are age 14-Adult. Her flute students enjoy a comfortable rapport and learn music skills from the fundamentals through advanced. All ages for flute are welcome. Darralyn’s students who enter them, place highly in the Wisconsin School Music Association contests and the Wisconsin Federation Music Club Festival events. She began her musical training on the flute as a child and then became interested in pursuing classical singing. As an undergraduate student at UW-Whitewater, Darralyn studied both voice and flute and then earned a Master’s Degree in Voice Performance at the prestigious Peabody Conservatory in Baltimore. While in Baltimore, she made her professional debut with the chorus in the production Turando. She continued her professional training at the International Institute of Vocal Arts in Chiari, Italy where she sang Hansel in Hansel und Gretel and Cherubino in The Marriage of Figaro. Darralyn has made professional appearances locally at the Festa Italiana, The Italian Community Center, the Schauer Center, the Sharon Lynne Wilson Center, and the Janesville Arts Center. Danielle is an undergraduate student at Baptist College of Ministry in Menomonee Falls and is majoring in music with an emphasis in string pedagogy. She has participated in Indiana University summer string academy as well as in the Falls Baptist Church music program. She has had the opportunity to study under Elizabeth Zempel, Mimi Zweig, Suzanne Ignaszak,and Jamie Hofman. In addition to her studies, she has been able to participate in master classes with Erin Aldridge and Wyatt Sutherland. Danielle started violin at the age of three and has continued her study for the past 20 years.She currently teaches private lessons ranging from beginner level through advanced and also leads orchestras and groups on a regular basis. Jenn recently graduated from UW-Whitewater with a Bachelor of Arts in Music and a minor in Arts Management. She began her musical training by taking guitar lessons here at Music Dynamics at the age of 12 and has also studied under Lake County local, Ira DeBoer. 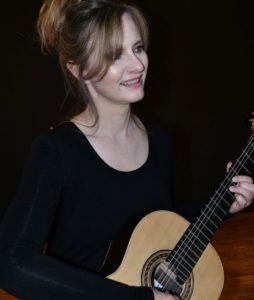 Throughout college, she studied with college professor George Lindquist – one of the foremost teachers of classical guitar in Wisconsin – and performed as a member of the UW-Whitewater Classical Guitar Ensemble. Currently, she performs as part of the duo Em & Jenn, and the two can be found performing at festivals, farmer’s markets, and various events such as Friday Night Live downtown in Waukesha. She is also planning on pursuing her Master’s degree in Guitar Performance, specializing in classical guitar. Jenn is excited to be teaching classical guitar here at Music Dynamics and is looking forward to sharing this instrument with her students! Robin is a classical guitarist and pianist with a BA in Music from Carroll University. She is passionate about the value of music education to enrich lives. She has been teaching guitar (classical approach) and piano since 2007. Her students can expect an emphasis on strong basics through an individualized, balanced program of study. In addition, students are encouraged to explore their interests, discover new musical territory and engage in creative projects. Performance opportunities are offered at various times throughout the year. 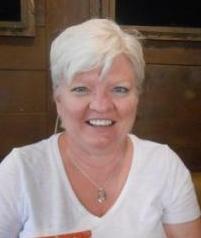 Ms. Wholfeil is a member of the Music Teachers National Association and the National Federation of Music Clubs. She is also certified as an Early Elementary Piano Specialist through the Royal Conservatory of Music (Canada). Robin is experienced in preparing students for assessment exams for the Music Development Program for Preparatory through Level Four (in both piano and guitar). These exams are offered twice per year in Waukesha County. Her students also regularly enter Federation of Music Festivals, Baroque Festivals and other local events. As a Musikgarten licensed instructor, Robin believes in the benefits of early interaction with music for the young child. In this program, parent and child enjoy singing songs and movement together while building important music foundations. Enjoy exploring the world of the guitar. 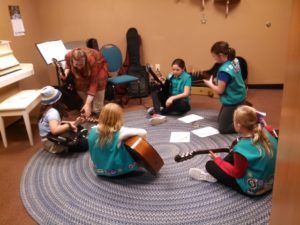 As a beginner, students are instructed to establish healthy playing postures and use of technique as they develop skills in rhythm, reading musical notation, simple chords and ensemble playing in a fun group setting. Performing Groups: Milwaukee Mandolin Orchestra (guitar), Milwaukee Classical Guitar Society Guitar Orchestra, various small ensembles and groups, chapel pianist for Kirkland Crossings Senior Living Community. Rachel teaches all beginning band instruments and specializes in low brass for beginning to advanced students. Rachel Deutsch began her musical training with piano at age 7, but she began singing and composing as early as 3 years. In middle school, she picked up the trombone and began studying under Lake Country local Randy Hake in high school. She continues to play trombone and recently received her B.A. in Instrumental Music Education from Augustana College in Rock Island, Illinois. Rachel loves working with band students of all ages and has a passion to see her students grow musically and academically. Rachel has performed in the Arrowhead High School Wind Ensemble and North Jazz Band, the Augustana College Symphonic Orchestra and Band, and numerous low brass ensembles. She has toured the Midwest and throughout Japan, playing trombone with the Augustana College Symphonic Band. Rachel has studied under leading contemporary interpreter of saxophone, Randall Hall; ground-breaking composer Jacob Bancks; conductor and brass professor James Lambrecht; and low brass professor Samantha Keehn.